Kristina Esfandiari has been making music for more than a decade, but she’s still in the process of learning some things the hard way. 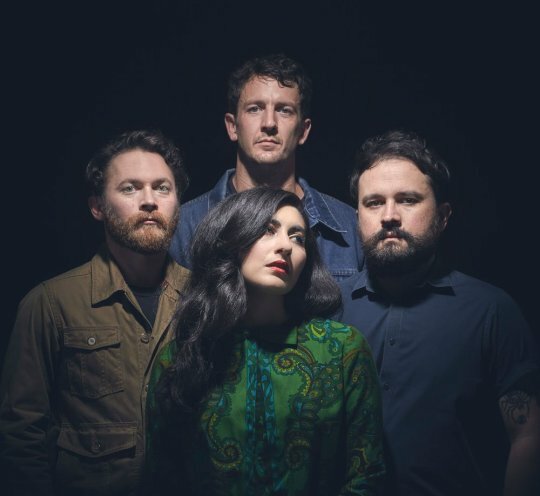 The frontwoman for San Francisco-based doom-gaze outfit King Woman hasn’t stopped moving for much of the past few years, in large part because the band has been on tour in support of their 2017 debut album, Created in the Image of Suffering. It’s the band’s first release for heavy music super-label Relapse, which earned them critical praise as well as prominent appearances at festivals such as Hopscotch and Desert Daze. From the outside, it probably seemed like everything a band could ask for. Yet Esfandiari found herself pushed to the limits by the end of 2017, realizing that she had perhaps been doing too much. Too much touring. Too many interviews. Too little time spent living a life away from the stage. With some time off before the band’s next tour, she’s had a change of attitude about what it means to be a professional musician. Just because an opportunity comes up, she says, doesn’t mean you have to take it. King Woman never expected to reach this point so quickly. The band—comprising Esfandiari, guitarist Colin Gallagher, bassist Peter Arensdorf and drummer Joey Raygoza—rushed into the recording of their 2015 EP Doubt after being approached by label Sargent House. The result was four songs of diverse, tuneful and supremely heavy doom metal with elements of dream pop and psychedelia. When it came time to record Created in the Image of Suffering, the band didn’t do much planning ahead, either, though the result is a much bigger and eclectic sounding set of music. Opening track “Utopia” crackles with feedback before exploding into a Sabbath-style dirge, while “Manna” has a spacious, shoegaze vibe steeped in delay effects. And the epic closing track, “Hem,” has an eight-minute build up into one of the band’s most cathartic songs. Theirs is a singular sound, which is all the more remarkable when Esfandiari admits the band had to figure it out along the way. Created in the Image of Suffering is heavy, but in more ways than one. It’s musically dense, loud and even crushing at times, but it’s also emotionally heavy. Esfandiari channeled her troubled experiences growing up in a cult-like Christian sect on many of the album’s songs. On “Worn,” she laments her lost youth (“I wish somebody would have told me/Because the past you can’t get back”), while expressing concern for her own family on “Deny” (“I pray my mother/ Won’t you ever find a cure?”). These are some intense feelings to channel, especially when they’re part of a nightly live set list. Still, Esfandiari says they fade over time. Now her concern is the physical toll of the band’s powerful live performances. King Woman’s music doesn’t fade into the background. It’s a sound that’s meant to be engaged with, which means it can be a pretty exhausting experience for both the band and the audience. Yet at the end of the day, it’s meant to be something that can potentially appeal to anyone, whether they’re metalheads for life or entirely new to heavy music.